The guidelines below do not apply to any species of snake larger than a corn snake. Speak with a CoRHS staff member regarding habitat requirements for Burmese Python-sized snakes. 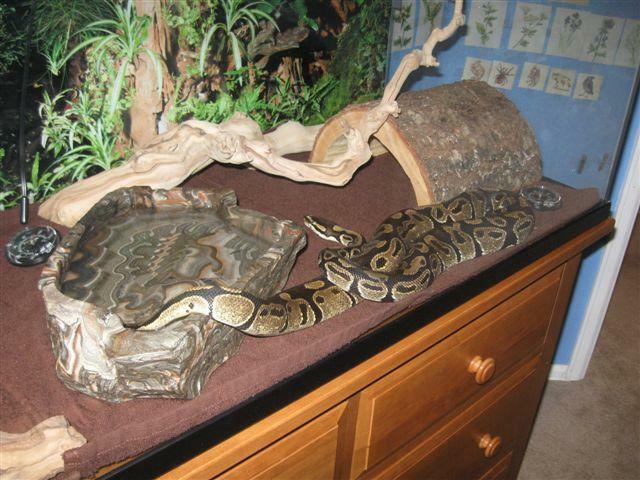 heating elements (human heating pad, under-tank heater, ceramic heat emitter/element (CHE), radiant heat panels (RHPs), black or red bulbs) -- snake must be protected from being burned by hot surfaces. Note: if you purchase a human heating pad, make sure it does not have an auto-shut-off feature. Human heating pads are UL listed for humans so are reliable. CoRHS' recommendation is to use a CHE of the appropriate wattage for the space. A 150W CHE will typically heat one end of a 40 gal or 55 gal tank sufficiently (depending on ambient room temp) You will need to test it in your environment to ensure proper temps. A far superior heating option is the use of RHPs, because there is no burn risk. Always be sure to have a second heat source available should your first one fail. substrate that facilitates easy cleaning (used towels, indoor/outdoor carpet, shredded paper product, shredded cypress mulch). CoRHS cautions against the use of potentially harmful substrates that are readily available in pet stores: e.g., cedar mulch, sand, pine shavings, etc. Cedar and pine give off toxic fumes and sand can be ingested (causing bowel impaction) and cause severe eye damage. enrichment items (fake greenery, branches, plants, paper towel tubes, etc.) 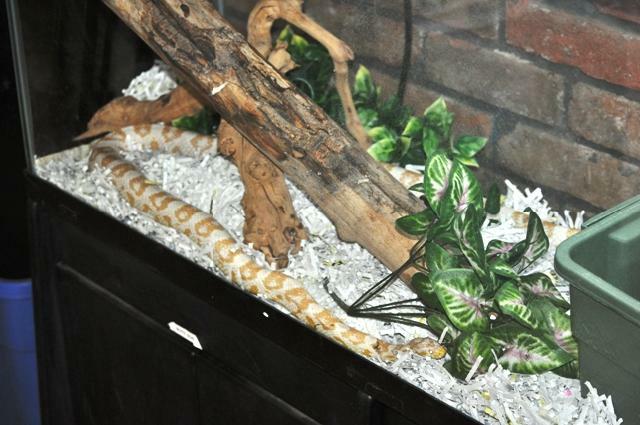 -- Change items no more than quarterly to avoid inducing the stress that cleaning and change may cause a captive snake.